Italian for barley salad, this dish is a refreshing orzo salad, with garbanzo beans, grape tomatoes and Cervasi Red Wine Vinaigrette. Great as a main dish or on the side of any meal. Pour the broth into a heavy large saucepan. Cover the pan and bring the broth to a boil over high heat. Drain the orzo through a strainer. 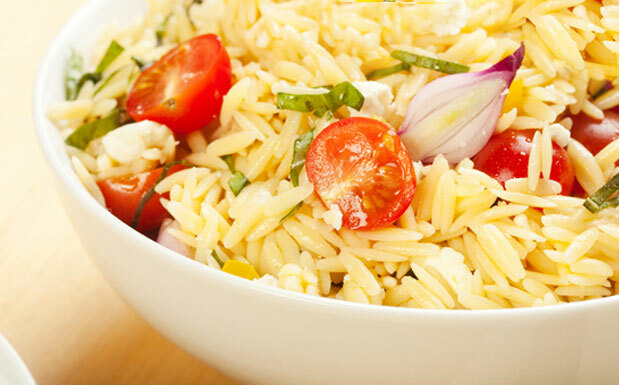 Transfer the orzo to a large, wide bowl and toss until the orzo cools slightly. Set aside to cool completely. Toss the orzo with the beans, tomatoes, onion, basil, mint and enough vinaigrette to coat. Season the salad to taste, with salt and pepper, and serve at room temperature.